(AP) -- The final day of the regular season has arrived, with one playoff spot to decide, seven of the eight first-round matchups still unknown and nine different seeds still not clinched. It also is the last day that Dallas' Dirk Nowitzki and Miami's Dwyane Wade will be NBA players before retirement. Dallas is in San Antonio, Miami is at Brooklyn. Nowitzki and Wade played their final home games on Tuesday night, both scoring 30 points apiece. It is the first day of the offseason for a few teams, including the Los Angeles Lakers -- whose season ended Tuesday with a loss to Portland and team president Magic Johnson stepping down in a move that few could have predicted. Washington, Cleveland, New Orleans and Phoenix also are done. The only known first-round matchup is in the Eastern Conference, where Indiana and Boston meet in Round 1. Every other matchup remains to be determined. There are no major individual races left to decide: Houston's James Harden is the scoring champion, Detroit's Andre Drummond the rebounding champion and Oklahoma City's Russell Westbrook the assist champion. But as for the playoff picture, it comes down to the last day in both conferences. -- Brooklyn is No. 6 with a win over Miami. -- Orlando is No. 6 with a win over Charlotte and a Brooklyn loss. -- Orlando is No. 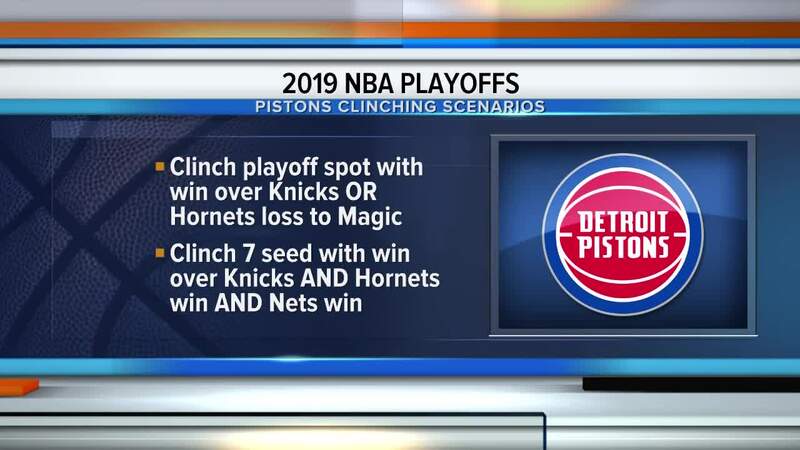 6 if the Magic and Nets both lose and Detroit wins. -- Brooklyn is No. 6 with a loss, combined with losses by the Magic and Pistons. -- Detroit's only path to No. 7 is if it wins, the Nets win and Charlotte wins. That is also the only scenario where the Magic finish No. 8. -- Charlotte gets in only with a win and a Detroit loss. The Hornets cannot get higher than No. 8. 6. Oklahoma City or San Antonio. 7. Oklahoma City, San Antonio or the LA Clippers. 8. Oklahoma City, San Antonio or the LA Clippers. -- Denver is the No. 2 seed with a win. -- Houston is the No. 2 seed with a Denver loss. Denver is the No. 3 seed with a loss. -- Portland is the No. 3 seed with a win and a Denver win. -- Portland is the No. 4 seed with a win and a Denver loss. -- Portland is the No. 4 seed with a loss. -- Oklahoma City is the No. 6 seed with a win or a San Antonio loss. -- San Antonio is the No. 6 seed with a win and an Oklahoma City loss. -- San Antonio is the No. 7 seed with a win and an Oklahoma City win. -- LA Clippers are the No. 7 seed with a win and a loss by either San Antonio or Oklahoma City. -- Oklahoma City is the No. 7 seed with a loss, a San Antonio win and a LA Clippers loss. -- San Antonio is the No. 7 seed with a loss and a LA Clippers loss. -- San Antonio is the No. 8 seed with a loss and a LA Clippers win. -- Oklahoma City is the No. 8 seed with a loss, a Spurs win and a Clippers win. -- LA Clippers are the No. 8 seed with a loss, or if the Clippers, Thunder and Spurs all win.